He coached with ingenuity and he taught by example, an apt summary of A. G. Ealy's stewardship at Eichelberger High School in Hanover. Originally from Vincennes, Indiana, Ealy played football and basketball expertly enough to earn an athletic scholarship to Franklin College. After a year there, he transferred to Battle Creek College in Michigan where he lettered in track, tennis, and basketball. His senior year he captained the basketball team on his way to All-Conference honors. 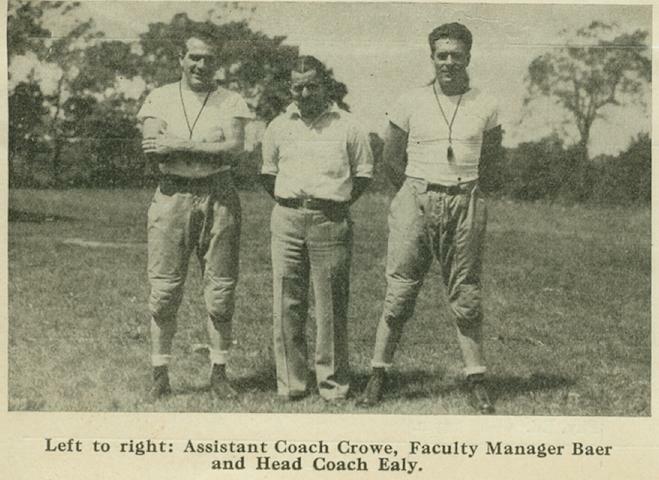 A. G. spent two years coaching at Oaktown, Indiana, before arriving at Hanover in 1938 as the football and basketball coach. Although a sound fundamentalist, A, G, never hesitated to gamble, to invent something different if he sensed the unexpected would tip the balance in the Nighthawks' favor. Besides his tactical skills, Ealy was an inspirational leader whose rapport with his charges made them perform above the level of their natural abilities. The results are apparent. 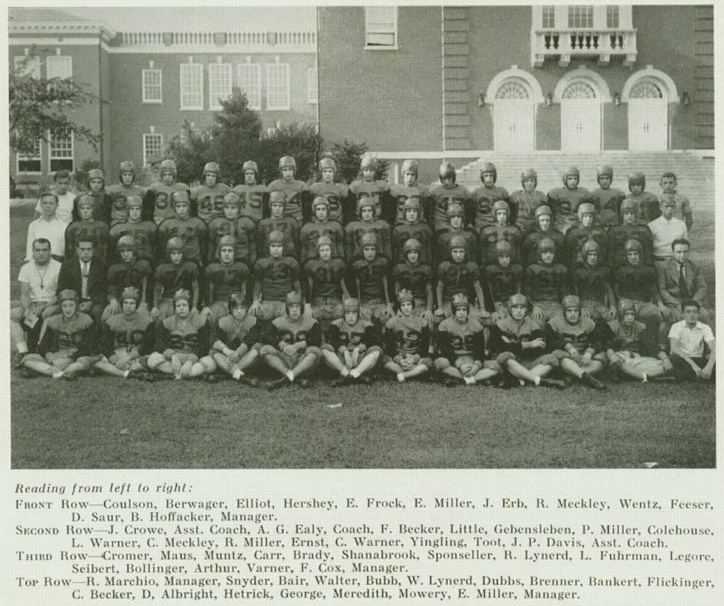 His six years at Hanover saw the football team win 40 games against 10 defeats and six ties, the best percentage margin in the school's history. 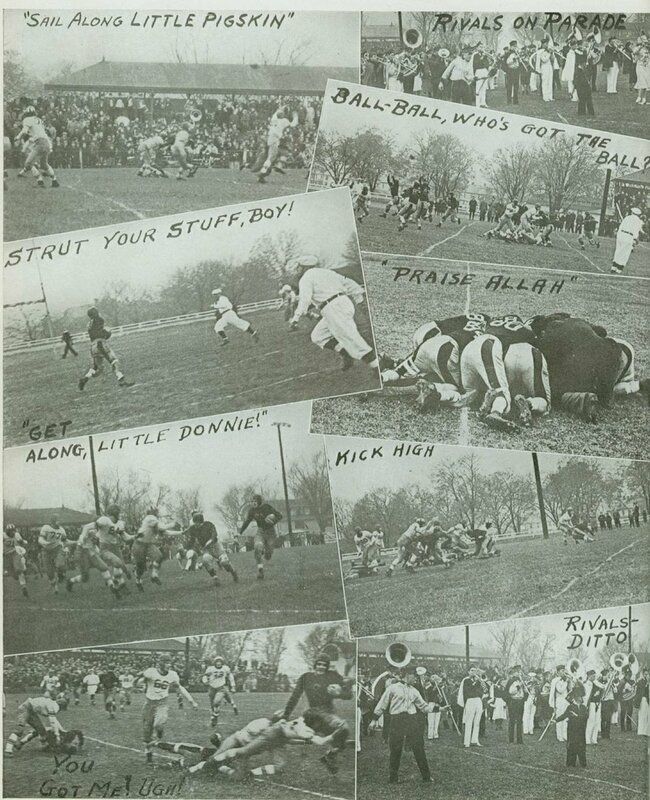 Hanover donned three South Penn Conference crowns, and during one stretch, 1940 to 1943 the andiron Nighthawks played twenty-one consecutive games without a loss. 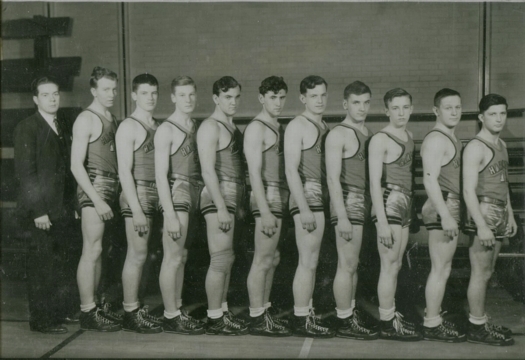 His squads were equally successful on the hardwoods. 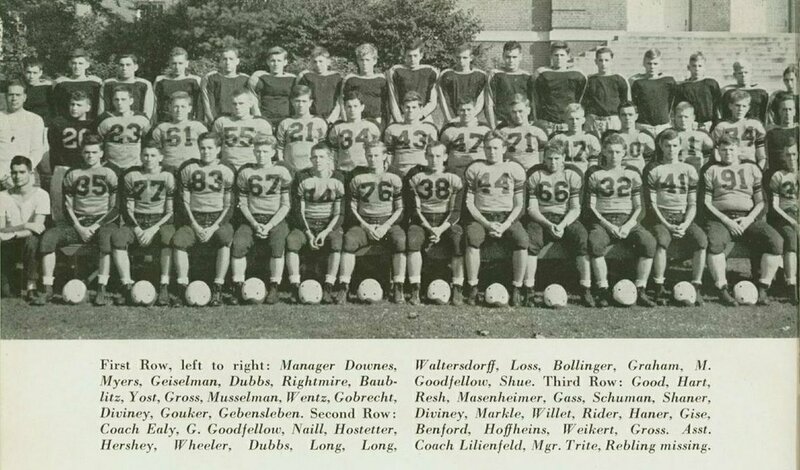 Under his guidance, the �Hawks� were 51 and 35 overall, and Hanover took the South Penn Conference Championship in 1939, ending the season as the runner up in District III. 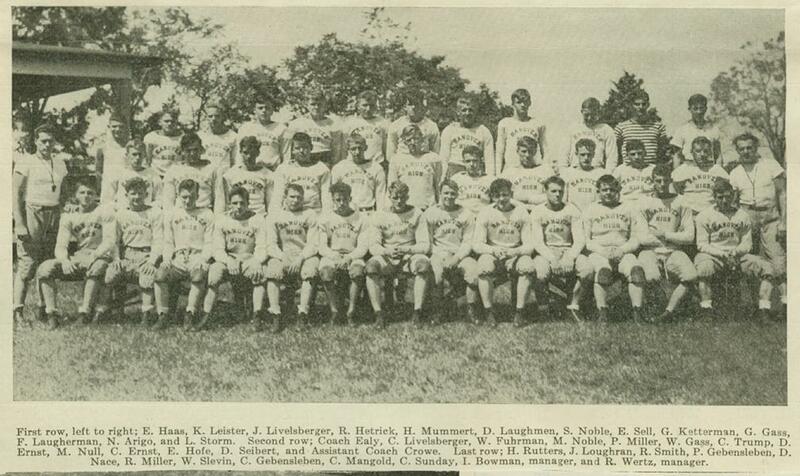 One of his enduring legacies to Hanover was the elementary basketball program he initiated soon after he arrived. 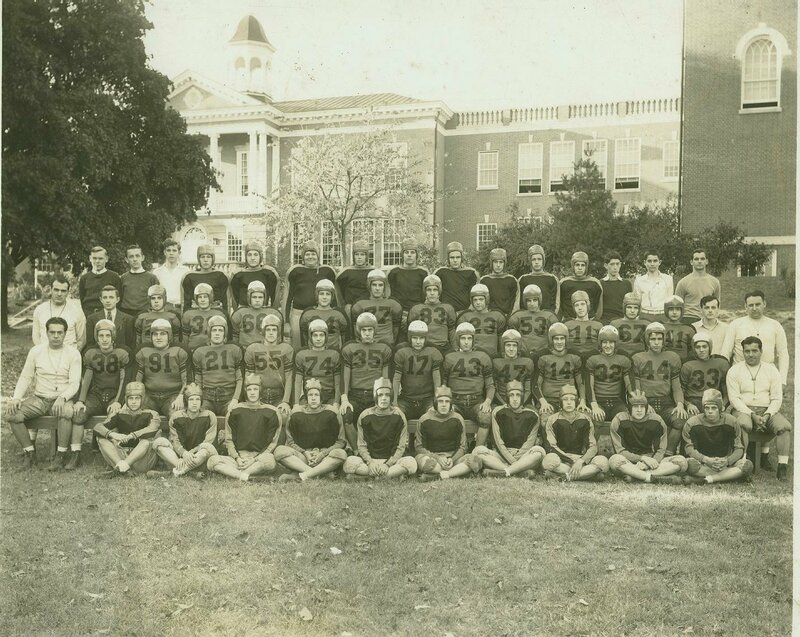 His coaching career was sidetracked by World War II when he served aboard ship in the South Pacific. The executive officer on a rocket launching ship, he had a close brush with death when his craft was sunk off Okinawa by a Japanese suicide plane in May of 1945. 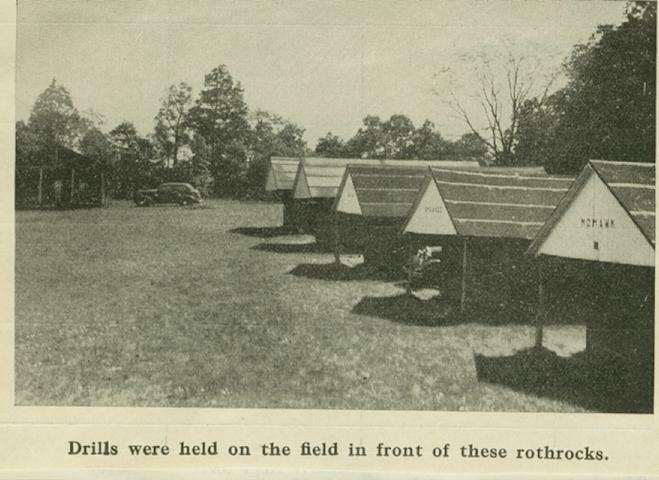 Returning to Hanover after the war, A. G. chose to enter industry rather than rejoin the teaching ranks. 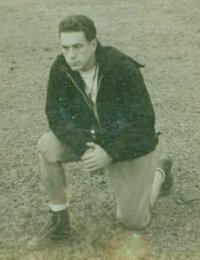 He rose to the position of vice-president of the Littlestown Hardware and Foundry Company, and after his sudden death in 1960, his company established the A. G, Ealy Scholarship, given annually to a deserving student-athlete from Littlestown High School. 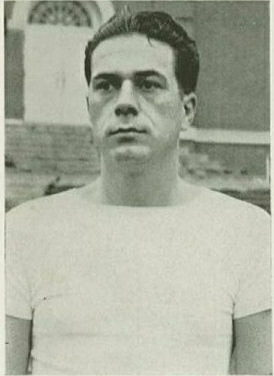 Figures seldom tell the whole story In A. G. Ealy's case, his example and influence extended well beyond the locker room, for he was universally admired by the entire student body, and it is interesting that so many of his former players made their own marks in coaching, among them, two Hall of Famers: Don Seibert and Gene Haas. Leading the Hawks to two Grid South Perm Championship Crowns in eight seasons is a very good record. In the eight years Ealy has coached Hanover teams have won 39, tied 6, lost 10. Ealy did the phenomenal in coaching Hanover teams which started a winning streak of 21 games won without a defeat. 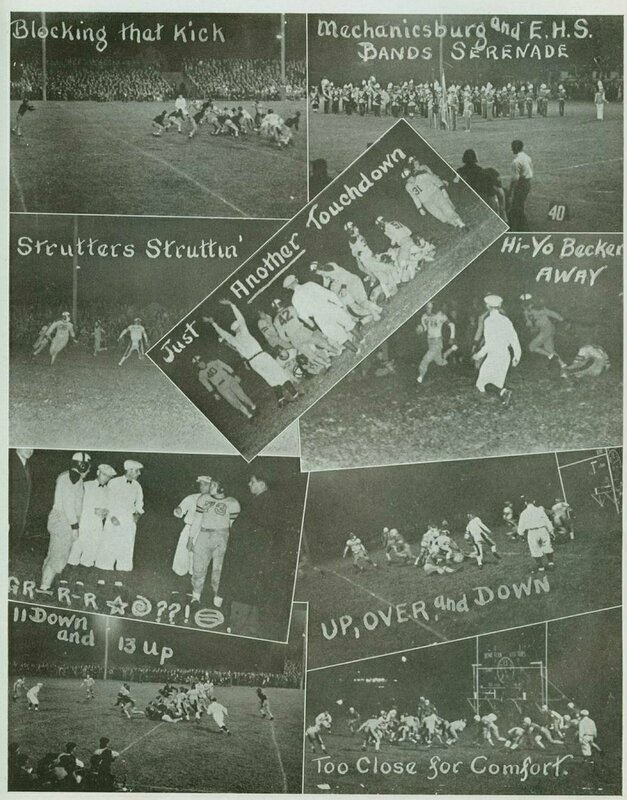 This started between the Carlisle game of 1940 until the game on October 15, this year, in which Chambersburg set them back by the same count as Carlisle did in 1940, which was 7-6. 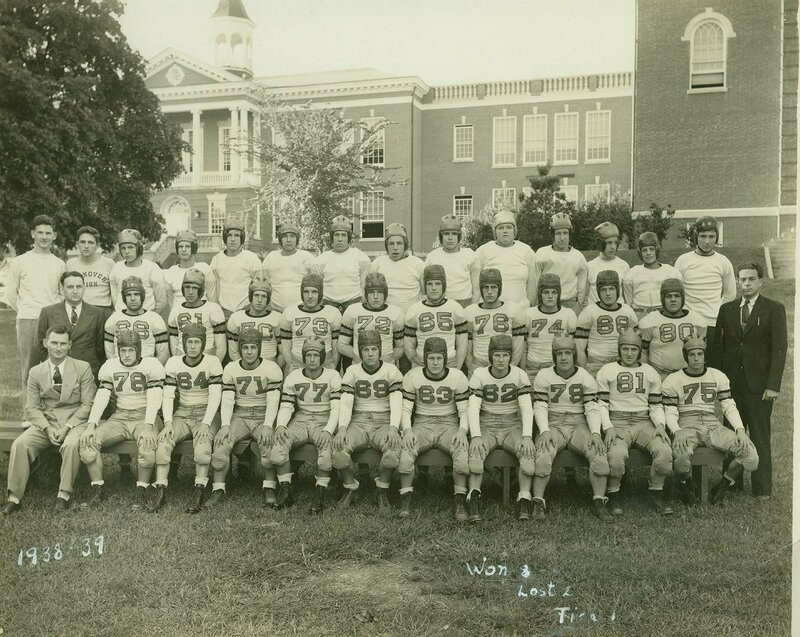 Age Ealy tutored the only Hawk teams that beat Mechanicsburg and Chambersburg. Eight opponents of the Hawks have never beaten an Ealy-coached team. 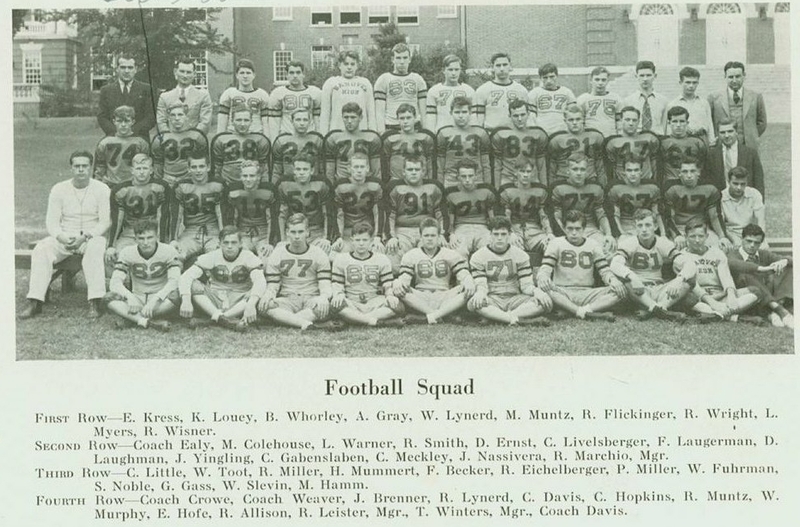 The Hawks opponents will he the only ones pleased about Ealy's resignation for he is well liked by all the pupils in E. H. S., also by the townspeople of Hanover. Whenever a person became ill or hurt Age would see that he received the best of care. In one sentence I would like to describe Coach Ealy. He is a man of clean speech, clean sportsmanship, clean living, highly educated, and a great adviser of two of Americans favorite sports, which are football and basketball. Third President and charter member of the Hanover Junior Chamber of Commerce, Age, as we know him, has always been one of the most active members of our organization. 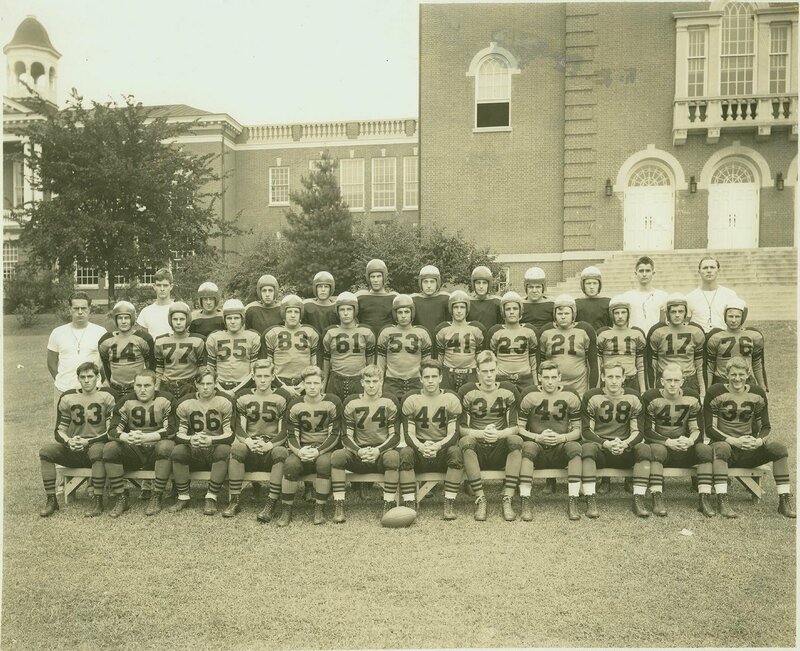 Coming to Hanover in 1938, he served six years as coach in the Hanover High School. In 1943 he left teaching to accept a position at the Hanover Canning Company. Shortly after, he accepted commission in the Navy and served as the executive officer of a rocket landing ship until his ship was lost in action, at Okinawa, He was recently discharged from active duty with the rank of Lt. At present he is associated with the Littlestown Hardware and Foundry Co.
left to right: Coach Ealy, Burnell Weaver, Gene Haas, Henry Stick, William Fuhrman, Floyd Becker, George Ketterman, Donald Seibert, Robert Waltersdorf, Charles Sunday, Donald Hausenfluck. 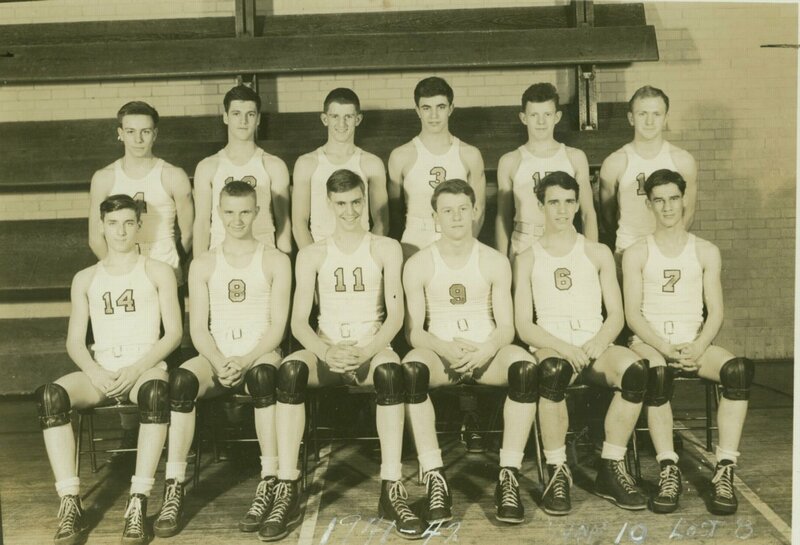 First Row (left to right): Riley Maus, Francis Brady, Donald Wentz. Donald Bair, James Rightmire, Charles Hershey, John Carr, John Davis. Bill Seibert, John Gross, Bob Bollinger and Ralph Varner. 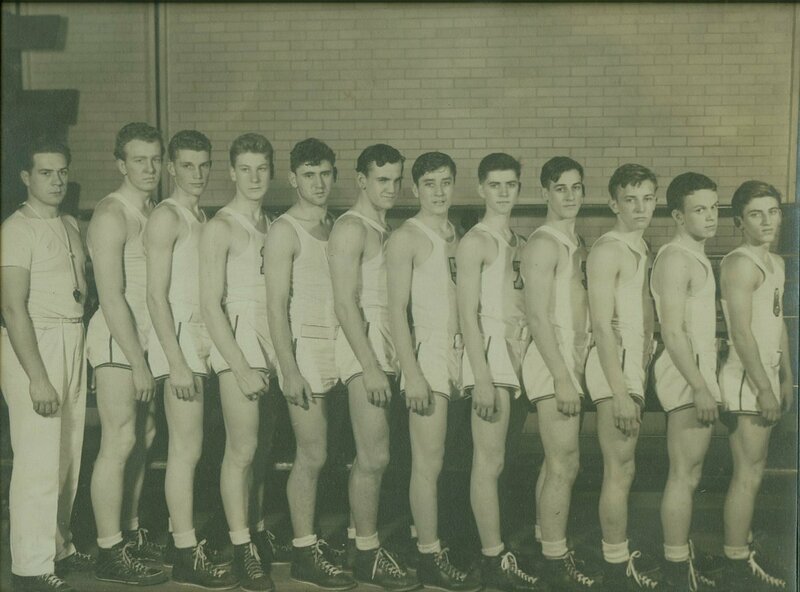 Second Row: Coach Ealy, Wendell Yingling, Harold Catherman, Marvin Hershey, Albert Musselman, Kenneth Rebling, Earl Walter, Tom Diviney, Burtis Dubbs, Victor Gouker, Joe Erb, George Wisner, and Dean Yost. 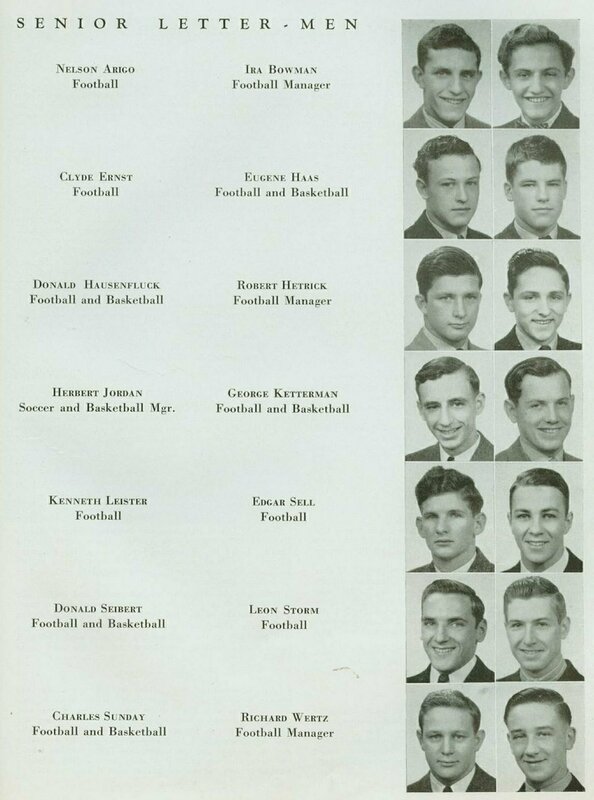 Third Row: Gene McCarey, student manager, Joseph Loss, LeMar Lehigh, Jim Goodfellow, Robert Shenk, George Coulson, Don Geiselman, George Gebensleben, Robert Boyer, Bill Downes, student manager, and Fred Lillienfeld, assistant coach. 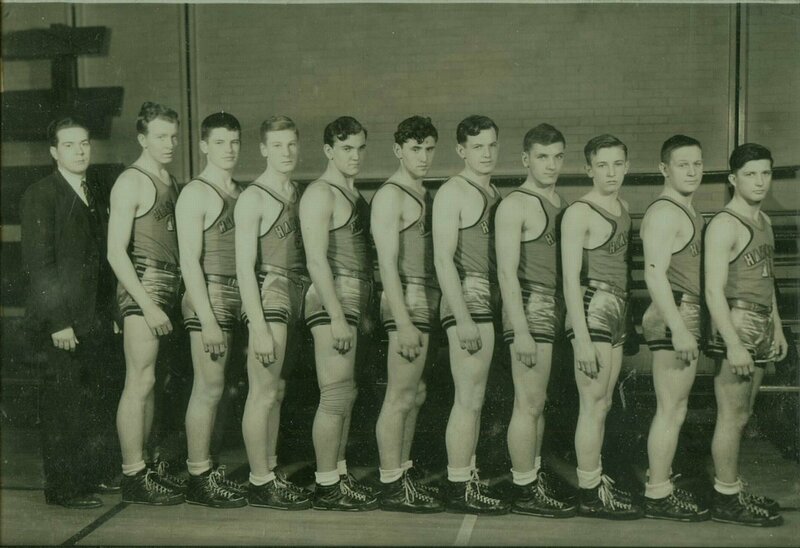 Not represented when the photograph was made were Francis Heck, Raymond Allen, assistant coaches Witmer, Himes and Ferister.